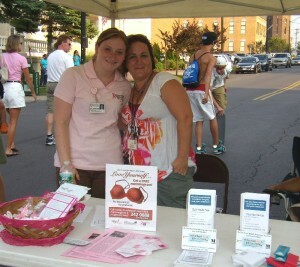 OSWEGO, NY â€“ Representatives from Oswego County Opportunitiesâ€™ Cancer Services Program Partnership and the Facilitated Enrollment Department were at the chamber booth at the Oswego Farmersâ€™ Market recently to discuss health insurance options with the community and to raise awareness of the importance of women receiving regular screenings for breast, cervical and colorectal cancer. Pictured are Katie Batchelor (left) and April Miano. They spoke with market-goers and distributed information on Family Health Plus, Child Health Plus, Medicaid and the free cancer screenings that are available through the Cancer Services Program to uninsured men and women aged 40 and older.Â For more information on health insurance options offered through OCOâ€™s Facilitated Enrollment Department or the free cancer screenings available through OCOâ€™s Cancer Services Program Partnership. You may contact them at 342-0888 ext. 1454.